"Supernatural" Season 9 picked up where Season 8 left off - a meteor/angel shower hitting the Earth in which all angels in Heaven find themselves entering vessels to live/walk among humans. In previous seasons, fans of the series have seen Sam and Dean Winchester experience hell and back with Dean dying and Sam being possessed by a demon. This season, however, is Sam's turn to face death. However, in typical "Supernatural" fashion, the series finds a way for Sam to extend his demise to the brink of elimination when one said angel enters Sam's "vessel" after Dean makes an open call for help. Season 9 finds its way back to the type of episodes that made this series what it is - ghost hunting at its best. In recent seasons, the storyline has gotten so in depth regarding Heaven vs. Hell that the fun and random ghost hunting episodes were few and far between. The series became very serious in terms of plot, and often times unbelievable, with dedicated viewers (this one) vowing to stop watching. Thankfully, Season 9 is a good mix of seriousness and fun with various plot points coming to fruition to push the storyline forward mixed in with random, fun episodes including Dean developing traits of a dog in order to communicate with animals. Without giving too much away, Sam gets healed (of course this happens) and Castiel becomes an angel again (well, duh! ), albeit without his wings so he must travel by car, in which the writers of "Supernatural" have deemed, according to Crowley the Demon (who by the way is working alongside the trio - twists, right?) as a pimp mobile. The journey to reopen the gates of Heaven is fun filled and the result is an exciting 23 episode season that brings back all the ghost hunting and crazy characters that have made the series fantastic. 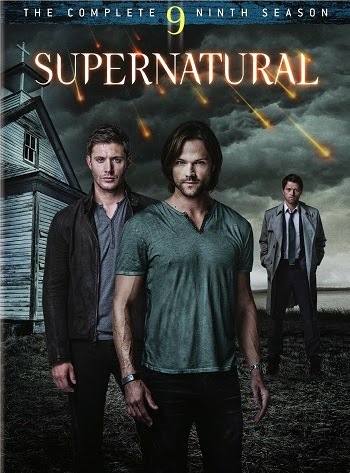 "Supernatural" Season 9 is now available on Blue-Ray and DVD.